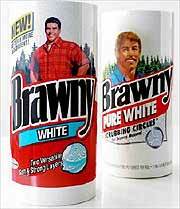 As mascots go, the Brawny Man has always been kind of a weird one. He’s been a barrel-chested avatar of masculinity in a lumberjack shirt–sometimes with a Tom Selleck mustache, sometimes without–bearing, er, a roll of paper towels. We’re sure that the idea of reaching for a hero with big biceps when you need to clean up your unfortunate spills made perfect sense in eras past, but this is 2016: The idea that the people who should be responsible for their household’s domestic chores are the ones who are attracted to a cartoonishly masculine figure in a plaid shirt is pretty dated–to say nothing of the idea that “strong” is best captured by an image of a random hunk. To that end, Brawny has updated its iconography with the #StrengthHasNoGender campaign–in addition to the barrel chest and biceps of the Brawny Man, they’ve introduced a whole host of additional Brawny Folks. Namely, they’ve got construction contractor Linda Alvarado, WNBA player Swin Cash, firefighter Maureen Stoecklein, and Morehouse School of Medicine Dean Dr. Valerie Montgomery Rice wearing the buffalo plaid and talking about gender, gender roles, and the notion of strength. The brand told Adweek that “the Brawny Man isn’t going anywhere,” but expanding the conversation around strength is interesting. Also interesting is the specific language used in the campaign created by the San Francisco-based Cutwater agency–as we move toward a more inclusive world for transgender and non-binary people, phrases like “strength has no gender” strike a different note than just “women are strong too.” That’s a lot to put on paper towels, but if there’s a brand strong enough to carry it, it might be the one that dresses people up like lumberjacks.